OMG! My mom said you named me. My name is Valerie Vinnisha!! She said she met you at the STAR Cafe in Manhattan on 23rd St. between 6th and 7th Ave. Her name is Ozell. She also told me that you invited her and my dad to see you perform on Broadway. Well, I never knew that until today. When Coming to America came out I thought you were the most beautiful Princess of them all. 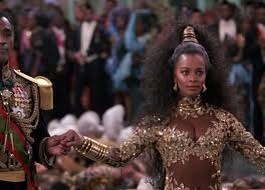 And to this day, most African-American young women want to be that Princess!! Look at Candi. Im now 47 years old. Just want to say Thank You. Happy New Year! Continue with Health, Wealth, and Much Love.